The requirements were revised in 2002 (34299A). Show how to ride a bike safely. Ride for at least half an hour with an adult partner, your family, or den. Participate in a pack, den, or community bike rodeo. Demonstrate how to repair a flat tire on a bicycle. Make a poster illustrating different types of early bikes and show it to your den. Give a demonstration to your den or pack on the proper use of safety equipment and gear. With the help of a parent or adult partner, register or reregister your bicycle. Go on a "bicycle hike" with your family or den. 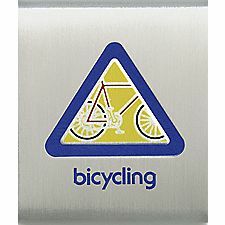 Obey traffic rules related to bicycling. Repair or restore a nonfunctioning bicycle to a safe condition. Include the installation of all proper safety devices. Visit a bicycle race or exhibition. Help set up a bike rodeo or bike competition for your pack.